Have you ever found weeks worth of homework assignments in your ADHD students desk, shoved ‘way in the back? If you have, then you want to read this section. Parents, does your ADHD student spend two hours at home working, crying, whining, and then working to finally complete a fifteen minute homework assignment, only to not get it turned in the next day in class? Then read through this section for some ideas to improve the situation. Use dividers and folders in his desk so he can easily find things. Teach him how to organize himself better. Help the child to organize his written work or numbers. Allow the child to move a pencil or his finger across the page while reading. If he’s writing, allow him to use one or two fingers for spacing between words. During math, graph paper may be very helpful to organize his numbers and columns. Your student will function better when able to anticipate times requiring increased concentration. A visual representation of the day’s schedule will provide another opportunity to internalize classroom routine. Completing school work and maintaining behavior during the school day can be exhausting experiences. Large homework loads on a regular basis can become discouraging for him and very stressful for the parent involved. Attempt to have homework reduced, if possible, and limited to guided practice on material that he has begun to master. Attempt to break down long term assignments into steps to lessen your student’s feeling overwhelmed. Consider having the student complete every third problem, instead of answering each one. Emphasize practice and assignment completion on the word processor to lower the frustration many students feel with written work. Break longer assignments into a series of smaller “sprints” for the ADD ADHD student to complete one after another. Your Attention Deficit student will feel less “overwhelmed” and he will complete the total project in far less time. 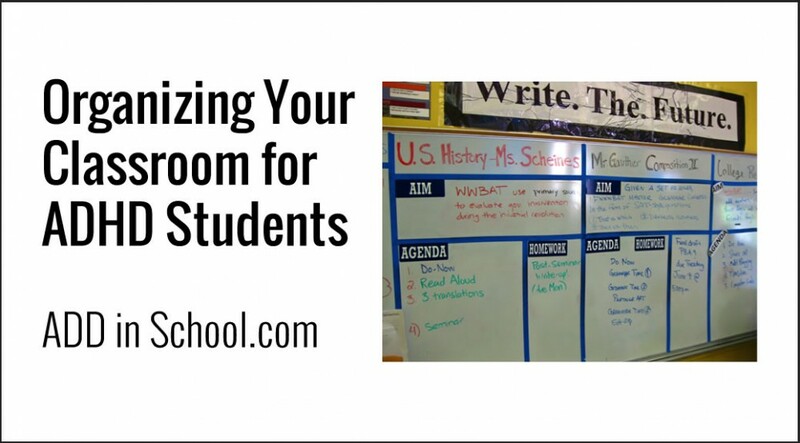 Model an organized classroom and model the strategies you use to cope with disorganization. Establish a daily classroom routine and schedule. Show that you value organization by following 5 minutes each day for the children to organize their desks, folders, etc. Reinforce organization by having a “desk fairy” that gives a daily award for the most organized row of desks. Use individual assignment charts or pads that can go home with the child to be signed daily by parents if necessary. Develop a clear system for keeping track of completed and uncompleted work such as having individual hanging files in which each child can place completed work and a special folder for uncompleted work. Develop a color coding method for your room in which each subject is associated with a certain color that is the that subjects textbook cover and on the folder or workbook for that subject. Develop a reward system for in school work and homework completion. One example of a system that reinforces both work quality and work quantity involves translating points earned into “dollars” to be used for silent auction at the end of grading period. For children needing more immediate reinforcement, each completed assignment could earn the child a “raffle ticket” with her/his name on it . Prizes or special privileges could be awarded on the basis of a random drawing held daily or weekly. Write schedule and timelines on the board each day. Provide due dates for assignments each day. Divide longer assignments into sections and provide due dates or times for the completion of each section. Tape a checklist to the child’s desk or put one in each subject folder/notebook that outlines the steps in following directions or checking to be sure an assignment is complete. Provide study guides or outlines of the content you want the child to learn, or let the child build her/his own study guide with worksheets tat have been positively corrected. Be clear about when student movement is permitted and when it is discouraged, such as during independent work times. Your student should be encouraged to utilize assignment sheets, broken down by day and subject. He or his teachers can record assignments at the completion of each task. An organizing time at the end of each day can be helpful to gather the necessary materials for the assignments and develop a plan of action for completion. This will greatly aid the development of the “executive processes”. Your student can become overwhelmed with floods of paper and be unable to find the needed materials. It is often helpful to carry only two work folders, one that contains work to be completed and one with work to be filed. Reviewing these work folders should become a regular part of the daily routine, with irrelevant work removed. Some students now take a small dose of their medication when they come home from school to aid in studying/homework completion. Check with the doctor about the time period of maximum medication effectiveness to help set up a sensible homework schedule. Quite often, variability in work performance will be related to the teacher’s style and your student’s temperament. Teachers tend to instruct using their own preferential learning style. Sequential teachers may help by providing more structure for him but the teacher may become frustrated with his disorganization and behavior. Random teachers, while not providing external structure, may be more likely to utilize flexibility in adjusting to his needs. Attempt to place your student with teachers who have similar styles that have proven effective for their particular needs. Some teachers have received training in dealing with students with attentional problems that would make them a particularly effective resource. One of the simplest interventions with the most power is to have an extra set of textbooks at home to minimize the problem of not having the necessary homework materials. Since fine motor activities and spelling can be a problem, consider a major emphasis on using a word processor at an early age. Software to practice keyboarding should have stimulating graphics to motivate their use. Using a “spell check” program is critical. Along with the “executive process” of organizing for homework at the end of the day, a daily check in time at the beginning of the school day can be helpful in preparing for a successful day. Checking the previous night’s homework, highlighting changes in the daily schedule, and even pre teaching some of the lessons for the day can ease stress. Your student should have a regularly scheduled time for cleaning his desk at least once a week. This will improve his ability to find his materials. It may, however, require the assistance/instruction of an adult to make this a successful experience.